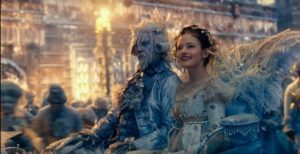 Disney tackles the timeless holiday classic “The Nutcracker” with the wistful holiday spirit we all need in our lives. Young Clara ( Mackenzie Foy) needs a magical, one-of-a-kind key to unlock a box that contains a priceless gift form her deceased mother. At the home of her mysterious and possibly magical God-Father (Morgan Freeman) a golden thread leads her to the coveted key, but it soon disappears into a strange and mysterious parallel world. In this new found world, she meets a soldier named Phillip (Jayden Fowora-Knight), a group of mice and the regents who preside over three realms. Clara and Phillip must now enter a fourth realm to retrieve the key and restore harmony to the unstable land. A land Clara soon discovers she is the heir to. Caught between a web of lies Clara must unravel the truth and set the world back in balance before it falls to the forces of evil. This is the perfect holiday film for the entire family. It’s a must see, especially over the upcoming Thanksgiving Day holiday. The Nutcracker is filled with Disney easter eggs. You’ll love the nod to Fantasia, for those fond of the original. Be sure to stay through the end credits as it features a gorgeous solo followed by a duet with the legendary Misty Copeland.